A reminder of the deadly destruction in the conflict in Mykolaivka in the Donetsk region of eastern Ukraine. 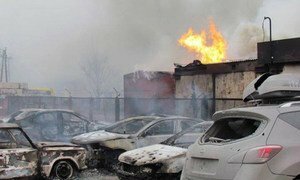 The estimated death toll caused by the continuing fighting in Ukraine has now surpassed the 6,000 mark, the United Nations human rights office confirmed today, amid broader warnings that the country stands on the brink of a “new and very deadly chapter” in its conflict. According to the latest human rights report released by the UN Office for the High Commissioner (OHCHR), the surge in fatalities in the Eastern European country has continued despite successive ceasefires as Government and rebel forces have escalated their fighting in recent weeks, particularly near the airport in Donetsk and in the area around the town of Debaltseve. The clashes have resulted in hundreds of deaths, both civilian and military, and “an untenable situation” for those trapped in the strife-torn areas. “It is imperative that all sides comply with the provisions of the Minsk Agreements and halt the indiscriminate shelling and other hostilities that have created a dreadful situation for civilians – in stark disregard of international humanitarian law and human rights law,” the United Nations High Commissioner for Human Rights, Zeid Ra'ad Al Hussein, warned in a press release. In late February 2014, the situation in Ukraine transcended what was initially seen as an internal Ukrainian political crisis into violent clashes in parts of the country, later reaching full- scale conflict in the east. Despite the Minsk cease-fire, the situation in Ukraine has since continuously deteriorated, with serious consequences for the country's unity, territorial integrity and stability. Recent media reports have suggested a potential worsening of the situation amid claims of a massive recruitment campaign by anti-Government groups. The fighting has also sparked a massive outflow of refugees and displaced persons. Last month, the UN refugee agency reported at least 943,500 internally displaced persons (IDPs), with Ukraine's Ministry of Social Policy today counting some 980,000 people as currently internally displaced. Meanwhile, over 600,000 Ukrainians have fled the country, seeking refuge in neighbouring countries, particularly the Russian Federation, but also Belarus, Moldova, Poland, Hungary and Romania, since February 2014. The living conditions for civilians in besieged areas has steadily deteriorated amid indiscriminate shelling as well as “credible allegations” of arbitrary detention, torture and enforced disappearances, committed mostly by armed groups but, in some instances, also by Ukrainian law enforcement agencies, OHCHR added in its report.